DES MOINES, IOWA (NET Radio) - 4-H kids still raise livestock and compete for blue ribbons at state fairs. But in Iowa, at least, robots are moving in. A 4-H-sponsored robotics challenge at the Iowa State Fair this year drew 13 teams, more than double from last year. Some teams were turned away. 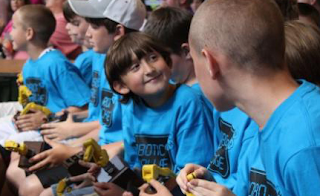 "This is definitely a really quickly growing segment of 4H: robotics and science, engineering and technology in general," said Holly Bignall, who works in Iowa State University Extension's science, engineering and technology division. She runs the robotics competition. "It appeals to urban youth," Bignall said, "and we're definitely trying to reach more urban youth, that's where most of Iowa youth are." 4-H, the rural and urban youth program sponsored by the U.S. Department of Agriculture, traditionally offers training in agriculture, home economics, conservation and citizenship. But Bignall said a big goal is to increase the number of youth interested in science, engineering and technology. "The robotics is really a team activity, she said, noting they aim to attract all kinds of kids, not just those into computer programming. Some are more into mechanics, gear ratios or design. At this year's Iowa State Fair, the competition the weekend of Aug. 13-14 was pretty intense. Students were making changes to their creations up until the last few minutes of their prep time - frantically reconnecting wires and taping on propellers. The most hands-on activity was the junk drawer challenge. Here, teams got a bag full of odds and ends to build their machine everything from straws to cardboard tubes to a small motor. The contraption would have to set off four mouse traps, and each glued to a corner of a poster-sized board. There was a whole range of elaborate constructions. Some teams built windmill-like blades out of cardboard or taped-together pencils. Then a small motor was attached to whip the blades and pop the mousetraps. After three hours, the teams brought their creations to the stage and put them to the test. Two teams at a time faced off, with 90 seconds to get their robot or machine to run the assigned task. Teammates groaned and cheered from the audience as bean bags slid into place, or sometimes landed frustrating close to the hole without sliding in. On this day, the grand prize went to the exuberant LegoMedics team. The Toxic Teens won the junk drawer challenge and the Stem Geneers won the robot programming contest. Competition organizer Bignall said they can hardly keep up with the kids, and are constantly surprised by the ways they tackle the challenges. While they always hope the competition pulls some kids to consider science and engineering for a career, Bignall said she's just happy to see so many kids excited about science. This is a awesome post because this post provides all the information of windows shortcut keys.